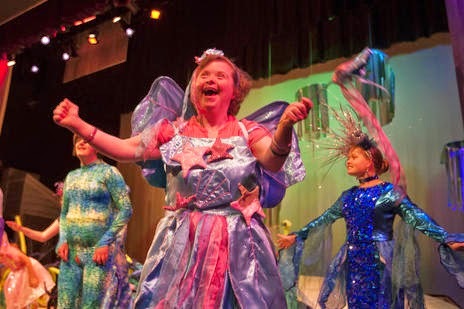 Mormon Moms: Special Needs: Actors Shine in "Little Mermaid"
Special Needs: Actors Shine in "Little Mermaid"
My precious little cousin, Holly, is featured in this recent Deseret News article about a theater company in Centerville, Utah, that offers a free 'Friend to Friend' program for those with special needs who are interested in Theater. The photo says it all. The joy of these precious souls is reflected in their beautiful countenances. I have learned MUCH from Holly. She is close to the Lord and close to the veil. Her love radiates to all whom she encounters. We have all been blessed by her life and...are so very grateful for our understanding of God's plan for His children and how we are each able to learn important life lessons from one another. She's an example to me of 'what matters most'. Sweet "Holly Welch' shines on-stage! I've come to know for myself that often the things that seem to be our greatest challenges; are often, also, our greatest blessings. That's been the case in my life and, perhaps, in the lives of many of you as well.